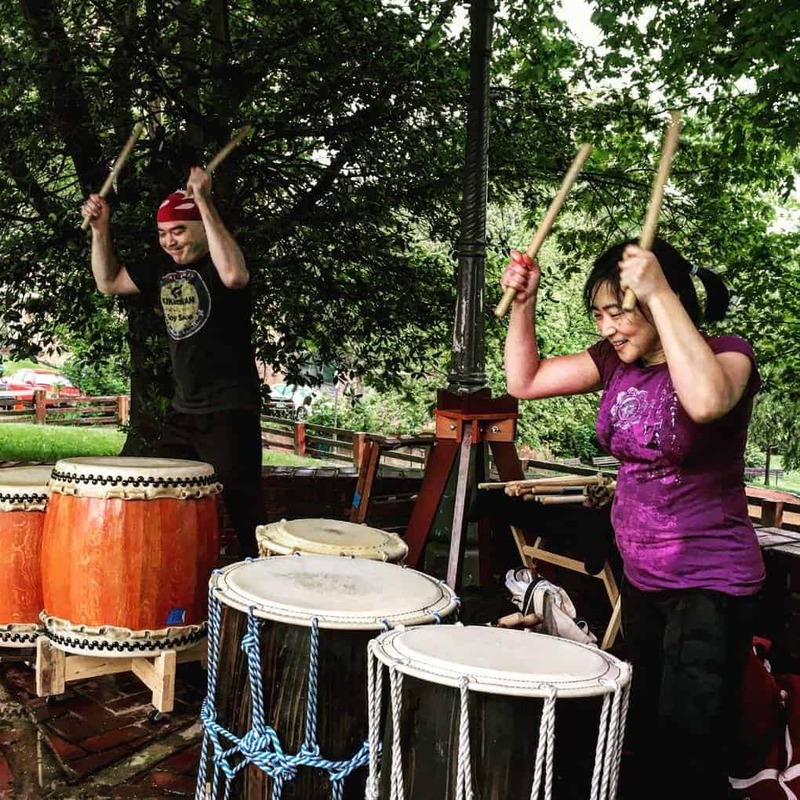 Experience Hachijo Daiko as it was meant to be! We’ll do our best to recreate the natural setting of where Hachijo Daiko is usually played on the island of Hachijo. Join us for an evening of Friends + Food + Drinks + Taiko! 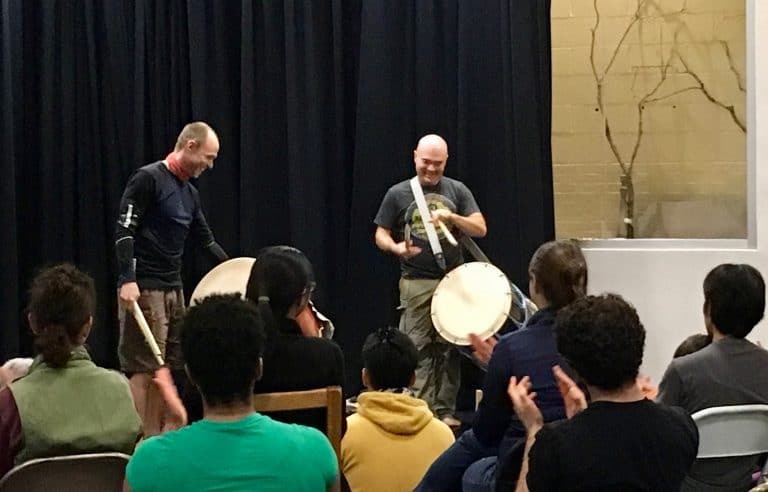 Your ticket for this evening’s event gets you yummy Japanese food, lots of camaraderie, and time to hit the taiko and try out some of your new Hachijo riffs. Just want to watch? That’s OK too, but we encourage everyone who took today’s workshops to join in the fun! Hachijojima is an island located 178 miles south of Tokyo. During the Edo Period, convicts who committed the worst crimes (political activism) were sent to Hachijo island. Often times these convicts were members of the educated Samurai class. They brought with them sophisticated art and culture to the island. Since their swords were taken away, legend has it that the samurai picked up bachi and played taiko as a substitute for martial arts and recreation. Today, 8,500 people live on this small island, and the spirit of the drum lives on in almost everybody. The style is truly improvisational, with just two people hitting on each side of the drum. Yuta Kato lived on Hachijo for 15 months and immersed himself in the taiko and culture there. Yuta Kato was born and raised in California to a Japanese-only speaking family. 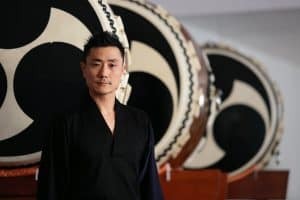 Introduced to taiko by Kagami-Kai, a local rice-pounding group, he decided to further his studies with San Francisco Taiko Dojo at the age of 10. Since then he has been a part of UCLA Kyodo Taiko, Nihon Taiko Dojo, Getsuyoukai, as well as professional groups TAIKOPROJECT, ON Ensemble, and Portland Taiko. From Fall 2007 until Winter 2011, he lived in Japan to study under masters of various traditional Japanese music. Upon returning to the US in 2011, he served as the Coordinator for the 2011 North American Taiko Conference, one of the largest gathering of taiko players from around the globe. Yuta is also a sought-after taiko instructor who has been invited to teach throughout the world. 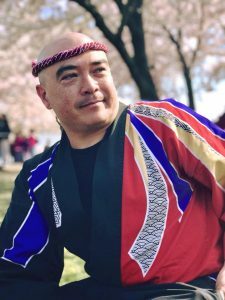 He currently resides in California, serving as the principal and instructor for LATI (Los Angeles Taiko Institute) housed at Asano Taiko US, which opened in 2013. He performs as a member of UnitOne (Torrance, CA). Register for multiple workshops and save! Keep the awesome taiko flowing all weekend … Join us for Yuta’s Meet the Artist performance (Friday, June 7 @8PM)!